Stunning platform satin navy evening shoes, by the designer Heavenly. An elegant peep toe shoe, with a feature rose bud to the side of the shoe. 9.5cm satin covered heel & 1.5cm satin covered platform sole. 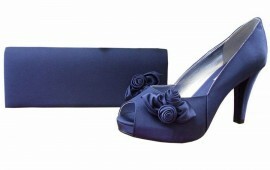 A matching clutch bag is also available, to match these beautiful navy ladies shoes. Your wardrobe will not be incomplete, without a pair of theses stunning navy blue ladies shoes and bags to match for weddings and special occasions. Absolute pleasure doing business with this company, so accommodating and a very quick reply to any questions I had, and gorgeous products. I will most definitely be using again Thank you. My shoes arrived this morning for my daughters wedding, I only ordered them on Saturday, they are beautiful, fit well and are comfy. Your delivery service was excellent and I am a very happy customer.